The Canton Community Health Fund (CCHF) increased the amount it awarded this year to over $30,000 to Canton projects that promote the health and well-being of Canton residents. CCHF also increased the scholarship amount given to three Canton high school seniors pursuing careers in a health-related field. While many non-profit organizations have lost money since the 2008 financial crisis, CCHF’s sound financial stewardship has resulted in a record amount of funds being donated to the community this year. CCHF has given 5 percent of the value of its fund annually for over 50 years. This year’s twelve recipients represent projects that benefit everyone from Canton’s youth to seniors with grants ranging from $400 – $5,000. “We’re so pleased to be able to give a record amount because it’s a challenge to keep up with the growing need,” says Lynn Miner, Chair of CCHF.One grant allows the nurse in every Canton school to purchase emergency response supply bags. “This means we can carry emergency medications and supplies directly to the site of an accident wherever it occurs at every school,” according to Diane Sodaro, School Nurse and Supervisor. Canton’s Senior and Social Services Department received funds for a wheeled drying rack for the Community Center kitchen. The Canton Police Department’s grant will purchase updated drug education kits that address the drugs currently used by Canton’s youth. Prior to receiving the CCHF grant, the Canton Police Department had to borrow kits from the state police. 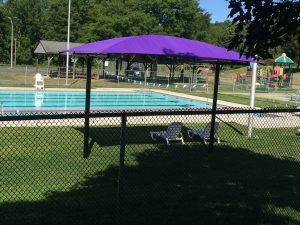 Canton Parks and Recreation Department’s award will purchase a third shade structure for the wading pool. The first two structures were funded in full by CCHF. 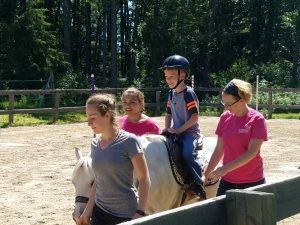 The Spirit Horse Therapeutic Riding Center of Canton will use their grant to continue to offer therapeutic riding lessons for Canton children with special needs. The Food Bank and Fuel Bank also received funds, as did Focus on Canton, an organization that helps residents that need temporary financial assistance. Canton Intermediate School was funded for a third year for the final phase of a food-recycling program. View the complete list of past and current recipients at cantoncommunityhealthfund.org. Additionally, three Canton seniors pursuing an education in a health-related field were awarded the Dr. Diters Scholarship. Devin Kadis intends to study kinesiology and prosthetics, Gabriel Ortiz will study medicine with a focus on global health; he is the first in his family to attend college and Kayla Underkoffler will study neuroscience. This year’s scholarship was increased to $1,500 per student. The scholarship was named after a longtime local physician, Dr. Diters, a beloved family physician who practiced medicine in Canton for many years. The first recipient of the Dr. Diters Scholarship is now a practicing pediatrician. CCHF is a private, nonprofit foundation run by an all-volunteer board of Canton residents. Founded over 50 years ago, CCHF’s original funds came from generous donations from Canton residents to the Canton VNA. When that organization merged with McLean in 1997, a fund was established to ensure those donations stayed in Canton to benefit Canton residents. Since its founding, an all-volunteer board works to oversee the investment and the distribution of the funds annually. CCHF welcomes any organization that improves the health and well-being of Canton to apply for funding by completing a simple online application. Canton high school seniors can apply for the annual Dr. Diters scholarship through the Canton High School guidance office. To apply for a grant or scholarship, see past recipients, make a donation or join the CCHF board, visit cantoncommunityhealthfund.org.